Every Sibelius user can benefit from this book. Buy it now! 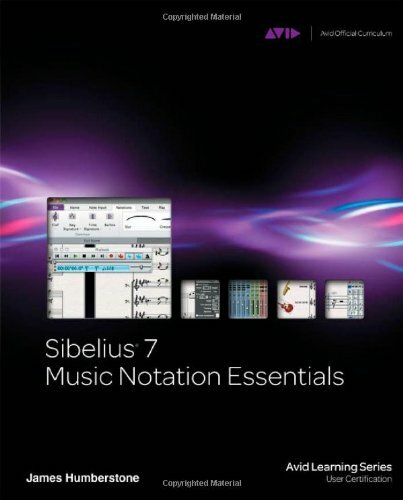 SIBELIUS 7 MUSIC NOTATION ESSENTIALS provides the most thorough introduction available to the fundamental operations of Sibelius 7 and lays the foundation for continuing studies at the more advanced levels. This book is built around five hands-on projects, including an introduction to the Sibelius 7 interface and basic editing operations; setting up a score and entering notes; importing MIDI, MusicXML, lyrics, and more; creating a worksheet; and scoring video. The learning method is tutorial-based, step-by-step, and visually compelling; the projects in the book are fully integrated with the accompanying tutorial videos and include many helpful screenshots and diagrams. On the companion website are 31 tutorial videos in which the author steps you through every key skill learned in each lesson. In addition, the accompanying CD provides you with all of the resources you need to complete the course in Sibelius, plus five extension projects. SIBELIUS 7 MUSIC NOTATION ESSENTIALS is the first crucial step in mastering Sibelius 7, the most popular music notation software in use today. I'm trying to write in plain chord changes. However, when I write C#min7 b5, for instance, Sibelius insists on writing 5b. I think it's the time for a new book for version 8. A pdf version would be better.